Daisy M. Tulley has been building a solo career alongside her day job in Bridezilla and it is proving to be impressive one. In front of the growing crowd she silenced the chatterers at the bar and delivered a set of haunting, stately songs that grew and faded at a funereal pace. Her voice was a curious mix of foreboding and sweet seduction, like a mix of Cat Power and certain moments of CocoRosie. The charm of Tulley also lies in her off the cuff remarks and down to earth demeanor between songs, switching from songstress to dry sarcasm with ease. With a setup that includes guitar, violin and loop pedals she conjured up some wonderfully delicate droning guitar passages that laid the foundation for songs about war, the end of relationships and ruminations on motherhood. A release of songs is due Ms Tulley. On the surface, the concept of First Aid Kit doesn’t sound like it should work. 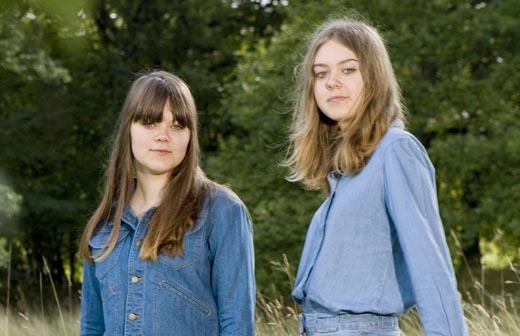 Aside from the less than appealing band name you have Swedish sisters singing folk and country songs – not generally something you’d expect would be an authentic experience. Thankfully Klara & Johanna Söderberg proved me wrong and by the audience reaction they had already won the hearts and ears of their fans before they struck a note. Endearing, cheeky even – the duo immediately struck up a warm banter with the crowd before captivating them with some strong, rich and heart-tugging harmonies. Initially the songs they opened with were more pop-centred and didn’t generate the chill factor that great aching harmonies can. Once they played their now famous Fleet Foxes cover of Tiger Mountain Peasant Song they seemed to step up a level and the magic began. That was the first of a handful of covers (Gram Parsons, Buffy St Marie, Fever Ray) that gave an insight into the formative styles that the sisters have worked into their own. To build the intimacy of the performance they played a song at the front of the stage with no amplification and it was a truly moving moment that had the venue spellbound. They repeated the moment for their last song by performing amongst the audience, literally bring the music to the people. The future of countrified folk is in good hands when authenticity can still be effortlessly achieved by the likes of First Aid Kit. This review first appeared in Drum Media. Tags: CONCERT REVIEW, FIRST AID KIT, Live, OAF, SYDNEY. Bookmark the permalink.